STEVE EMBER: Welcome to THE MAKING OF A NATION – American history in VOA Special English. I’m Steve Ember. Germany's attack on Poland and the start of World War Two in Europe presented a problem for Americans in September of nineteen-thirty-nine. The United States -- by law -- was neutral. And few Americans had any desire to fight in another world war. But most Americans did not like Germany's Nazi leader, Adolf Hitler. They hoped for victory for Britain, France and the other Allied powers. President Franklin Delano Roosevelt made this clear in a radio broadcast to Americans soon after the war began. STEVE EMBER: He praised the British and other allies. Finally, the president called on Congress to change the neutrality laws that prevented him from sending arms to the allies to help them fight Germany. Congress agreed to change the laws so foreign nations could buy American arms. In the months that followed, Hitler and his allies claimed one victory after another. 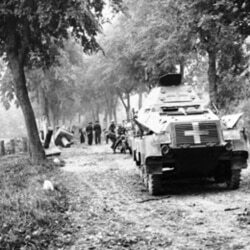 German and Soviet troops captured Poland quickly in September of nineteen thirty-nine. Then Soviet forces invaded the small Baltic nations of Latvia, Estonia and Lithuania. In late November, they attacked Finland. Fighting between Finland and the Soviet Union continued through the winter, until Finland accepted Russia's demands. Fighting grew even more fierce the following spring, in nineteen forty. Germany attacked Denmark and Norway, defeating them easily. In May, German forces struck like lightning through Belgium and Holland. Within one day, they were in France. British and French forces were unable to stop the Germans from moving deep into northern France. The British finally had to flee from the European continent. They sailed back to Britain from the French town of Dunkirk. German soldiers marched through France. And Italian forces joined them by invading France from the south. Soon, Paris fell. These are German newsreel narrators describing German troops entering Paris and the fall of the French government. A German supporter, Marshal Petain, took control of the French government. And France -- beaten and crushed -- was forced to sign a peace treaty with Hitler. Now it was just Britain alone against Hitler and his Axis allies. Only the English Channel separated the British people from a German army that seemed unbeatable. British Prime Minister Neville Chamberlain was forced to resign. 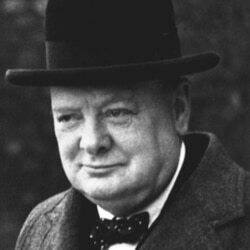 The British people turned to a new leader, Winston Churchill. STEVE EMBER: Churchill would prove to be strong and brave in the long months ahead. Hitler wasted no time in launching a fierce air attack on Britain. Throughout the summer, German and British planes fought above the English Channel. All this military action had an important effect on American popular opinion. War and neutrality were no longer just ideas to be discussed and debated. Now they were real concerns, real events. Fascist troops led by a dictator in Berlin were defeating one friendly democracy after another. And Soviet forces were on the march, too. Most Americans still wanted neutrality. But how long could America remain at peace? And was peace worth the cost of just sitting by and watching friends like France and Britain being bombed and invaded? Other issues melted away as Americans began to consider what to do about the darkening world situation. Some Americans, led by newspaper publisher William Allen White, called for the United States to help Britain immediately. But other groups, like the America First Committee, demanded that the United States stay out of another bloody European conflict. The struggle between those who wanted to help Britain and those who wanted to remain neutral did not follow traditional party lines. Some of the strongest supporters of Roosevelt's foreign policies were Republicans. Some members of his own Democratic Party opposed his policies. Even so, foreign policy was one of the main issues in the presidential election campaign of nineteen forty. The Democrats once again nominated Franklin Roosevelt for president. The Republicans had several popular candidates who were interested in campaigning against Roosevelt. At first, it seemed that these candidates would fight it out in a bitter nominating convention in Philadelphia. But to everyone's surprise, a little-known candidate named Wendell Willkie suddenly gained a great deal of support and won the nomination. STEVE EMBER: Willkie was a tough candidate. He was friendly, a good businessman, and a strong speaker. He seemed honest. And he seemed to understand foreign policy. Most importantly, Willkie had a progressive record on many social issues. He was not the kind of traditional conservative Republican that Roosevelt had defeated so easily in his first two campaigns. Instead, Willkie could claim to represent the average American just as well as Roosevelt. And he offered the excitement of a change in leadership. STEVE EMBER: While Roosevelt and Willkie began their campaign battles with words, German and British planes were fighting real battles with bullets over the English Channel. Winston Churchill sent a desperate message to Roosevelt. The British prime minister said Britain could not fight alone much longer. It needed help immediately. Roosevelt did not want to take steps toward war just before an election. But neither could he refuse such an urgent appeal from the British leader. Roosevelt and Willkie discussed the situation. Willkie agreed not to criticize Roosevelt when the president sent fifty ships to the British navy. He also supported Roosevelt's order for American young men to give their names to army officials so they could be called up if fighting began. In this way, Roosevelt and Willkie tried to keep America's growing involvement in the war from becoming a major political issue in the election. President Roosevelt won the election of nineteen forty. He won twenty-seven million votes to twenty-two million for Willkie. This made Roosevelt the first and only president in American history to win a third term in the White House. The Constitution was later changed to limit presidents to two terms. Soon after the election, President Roosevelt received a letter from Winston Churchill. The British prime minister wrote that Britain urgently needed more arms and planes to fight Germany. Roosevelt agreed. He went to the Congress to plead for more aid to Britain. He said the United States should change its neutral policy, because Britain was fighting a common enemy of democracy. Roosevelt also said the United States could avoid war if Britain was strong enough to defeat Germany by itrself. Congress agreed, after a fierce debate, to increase aid to Britain. And in the weeks and months that followed, the United States moved closer and closer to open war with Germany. In March of nineteen forty-one, Roosevelt allowed British ships to come to American ports to be repaired. In June, the United States seized ships under German control. It also took over German and Italian funds in American banks. Open fighting could not be prevented with this increase in tension between Germany and the United States. In September nineteen forty-one, a German submarine fired at an American ship. The ship was not damaged. But a number of American troops were killed in other naval incidents that followed. By the end of nineteen forty-one, the United States and Germany were almost at war. Even so, most Americans continued to hope for peace. In fact, few Americans could guess that war was just days away. The first blow would come -- not from Germany, however, but from Japan. STEVE EMBER: That will be our story next week. Our program was written by David Jarmul. You can find our series online with transcripts, MP3s, podcasts and pictures at voaspecialenglish.com. You can also follow us on Facebook and Twitter at VOA Learning English. I’m Steve Ember inviting you to join us again next week for THE MAKING OF A NATION – American history in VOA Special English.